A simple but useful kit to link two water butts together: when the first is full of water the second then starts to fill. 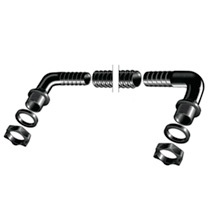 Kit contains 2 x ¾" BSP threaded connectors with nuts and rubber washers and approximately 1.5m of heavy duty 25mm hose. Link two water butts together easily!